Professional development, its a love hate sorta thing. Sometimes we choose what we want to attend finding some workshop or conference that excites us to no end where we can converse with our peers and collect buckets of information. Sometimes we have to sit through those wonderful days where we fight to pay attention through hours of irrelevant rambling that has nothing to do with anything about the music program or how we teach in our classes. Workshops and conferences; you have your district, your state, and national level all open to you. In my district it is a rarity to get all of the district music teachers together. We usually are at our own schools listening to maybe 50% of the day and getting sent to our rooms to do “work” for the rest of the time. When we do get together though, it is a time where we are productive and taking every second we get to talk about curriculum, retention, recruitment, and other topics of interest. If you are a person who plans district professional development days, be sure to let your specialists get together we’re more productive together than apart! Now, at my state level I have two options. Being a techie I try to attend our state tech conference every year. First year was not my favorite time, not only did I have no idea I had to be there early so I was stuck in a 2 hr metered parking space all day but I also attended all the workshops that were WAAAYY too beginner for me. The second year was better because I attended just an all day Ipad workshop, but still I had wished there was more to it. Something you should always keep in mind when attending a conference, Always challenge yourself go to the workshops you don’t know anything about or the ones that are about areas you are weak on. You are at a conference to get better at what you love right? I’ve made the promise to myself to give this conference one more go, and this time I plan on walking out of the conference center with my brain fried and ready to show off some new ideas. The other state option I have as a general music educator is our NHMEA conferences. Every state has a local music educators chapter and as far as I know they all put on state workshops and conferences. Our chapter has a small workshop day in the fall and one in the spring. Plenty of opportunity for educators of all shapes and sizes. I have attended these conferences in the past especially as a college student. The workshops at these conferences are usually eclectic depending on how many proposals the committees get from local educators ready to finally share their thoughts with their colleagues from around the state. Now, national conferences, that’s where it’s at man. you have the ISME conference, TI:ME, the conferences NAfME puts together, there are so many others. Let’s say you’ve never been to a national conference, then you need to attend anything NAfME. They have biennial conferences, division conferences, and then Music Education Week. I have attended a NAfME conferences in some shape or form since my freshman year of college almost 7 years ago. I come back refreshed and ready to go again. Recently attending Music Education week 2011, connections were made, inspiration was drawn and overall I just had fun. For this specific PD I took my partner in crime with me who teaches in Vermont and is a former college room mate. Just getting to DC was an adventure. Due to a scheduling error we didn’t leave her house in VT until about 4:30, drove several hours south to College Park Maryland (I drove all the way, it was hilarious trying to watch my friend trying to keep me awake. We ended up rolling into CP Maryland at about 1am with the windows down, the Lion King on Broadway blaring, and us singing at the top of our lungs hopped up on sugar.) We had to be up by 6am to make the metro for our hour long ride into DC to just barely make registration. You do not understand the amounts of coffee we had that morning, luckily her and I were in the General Music session and I quickly woke up after jumping around pretending we were high stepping horses and throwing scarves at each other. My most recent national conference was this past January in Louisville at the TI:ME/JEN conference. I was there for the TI:ME portion ready to learn about music tech from the elite. It was the best conference I’ve ever attended.We talked tech, we tweeted so much twitter practically cried, and I finally realized I was with the best seeing Dr. Joe Pisano slap a projector once and get it working again. Yup, he’s Chuck Norris. If you can’t make any conferences soon but need a little webinar to get you through? Check out : A great website to signup for webinars on various music tech. So,leery of going to a conference or workshop? Don’t be. You gain knowledge, make connections, reignite your passion, and best of all you create stories. As a district wide initiative this year Teach Like a Champion has been highlighted in every nook of my professional life at school. One of the biggest activities we have been focusing on is reading the book itself. The book contains 49 techniques collected from champion teachers across the states that create a structured, calm, successful learning environment. We talk about each chapter of the book in our specialist PLC, I have to say that just like all teaching technique books not everything works for a specialist. We work in short teaching increments sometimes 20 minutes, sometimes 1 hour. We don’t have time for everything because of the tight schedule our day to day leads us in. I may only be halfway through the book, but I chose 10 techniques out of what I have read that could apply in a music classroom. Next to each technique are explanations and opinions. No Opt Out – All students must participate. Don’t let them tell you “I don’t wanna”. If we let them tell us “no” now, how are they going to act in the future? No one can give a student the idea that they can get out of anything by just saying “no”. There is always another way to get a student to participate, trick them, coax them, it works. I started out this year with a few students who always told me no and gave me such a fuss, so I let them opt out I let them win. Now, I make a conscious effort to get all of the class up and moving, playing instruments and singing. No one tells me no anymore because they now have the expectation that I will get them to do it. Never let your students tell you no. Right is Right – When a student hears the word “right” that’s it, there is no more they need to add to an answer. Do not say “right” when the answer is only half of the way there. Unless a student tells you an exact answer in your words like that a whole note is worth four beats, you look for more. Maybe use “I like that Jimmy! But we have a little more to add, a whole note is worth four but four what?” When you hear the correct answer to your original question is when the word “right” is the correct way to answer them. If they just hear the word “right” the students will think they are all the way there and no other thinking needs to be put into the answer. Without Apology – Don’t apologize when you hear the groans. You have to teach it, you want to teach it, you need to teach it. Never say sorry for having students listen to Mozart, or composing melodies. In they end they’ll appreciate it when your students realize you gave them the best music education possible. Begin With the End – Every get stuck planning a lesson? Maybe the objective is not clearly in sight. Start with what you want your students to learn, begin with the end goal and move up to the activities, assessments and standards next. Do you want your students to write a melody? make that your goal and build around it. Post It – I use Evernote to do this. Post it means to post your goals for each lesson somewhere in the room so students can know what they are learning that day. I will write mine in Evernote for each class and will project them on the board. This way I can keep track of all my goals for the quarter so I can double check my curriculum is covered and each class knows what is going to happen every lesson. The Hook – How do you reel a fish in? A Hook!..How do you reel a student in? A Hook! Maybe they will remember what a quarter note sounds like by the funny voice I make them say it in or maybe they will finally understand melody writing by having a computer in front of them instead of a piece a paper. A hook captures a student’s attention long enough for them to learn what you’re trying to get across. Circulate – Just like it sounds, circulate around the room. I find myself consciously trying to cut the tether binding me to the front of the room and sit with my students. They might find it scary when all of the sudden I pop up behind them while they’re goofing off. I find it a great classroom management tool and just overall fun to hear them shriek. Wait Time – As I look back I find that a lot of my teachers never gave me enough time to think and answer a question. We sometimes tend to rush precious learning time for the sake of the overall school day schedule. I only have a small block of time with each class and do rush..A LOT. When I consciously make an effort to slow down and give them time, my students come up with more meaningful answers because I allow time to think! Cold Call – There is SO much to this but I only use a little bit. Cold call means to call on a student when they are not expecting it. It keeps them on their toes asking constantly keeping their attention at all times and is a great way to review, I can take the last five minutes of class and start asking simple questions right and left. It is kind of fun to blindside them all with review questions. I can also differentiate instruction by scaffolding the questions and asking students to determine their level of understanding. Vegas – Vegas Baby..or should I say Music Room Baby? Vegas is the concept of putting on the show, constant over the top engagement filled with sparkles, lights, camera, and over the top goofy fun. I tell my students what happens in music class stays in music class but with all the silly stuff we do it’s hard not to share! Top ten strategies for me in the first half of the book. If I get to finish it before the end of the year I’ll post 10 more but for right now take these, try one out and see what happens. You never know, you could be throwing your arms up in victory like a champion in no time. We are dreamers, makers, singers and shapers but we will never be champions until we create order out of all the chaos. Collaboration, big word I know but not unfamiliar to everyone. We think of the word collaboration as a way for our students to work together in groups or by classes in our school to achieve independent learning and discovery with the facilitation and guidance of a teacher like ourselves. Before the wonders of technology came around we could only collaborate in OUR school we taught at and ours alone. Then those creative and full of idea people we like to call programmers started to collaborate and come out with hundreds of ways we could connect with students and teachers in other schools, towns, districts, states, even countries. 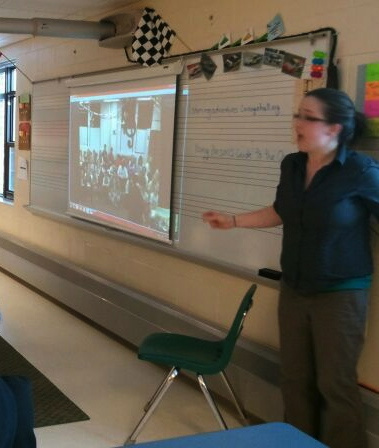 With the websites and tools available to us now, there is no limit to the ways we can connect and collaborate with each other to increase our students knowledge and experience with music. I am currently involved in 2 collaborative activities with other schools. One will start next week where a friend from college and I are getting our 2nd and 3rd graders to write A B and C sections of music and putting them together to make one song. We hope to possibly get a skype session in there to increase the familiarity with the classes and we’ll be passing our drafts back and forth using Edmodo! The second activity is with Andy Bowman’s choir (@music_andrew23) in Missouri. We met through Twitter, we talked about it over email, Skype, and Twitter and we got our choirs together to sing for each other and evaluated each other after. Now we have our students connected to an Edmodo account so we can continue the connection made and keep it going until hopefully the year ends! Edmodo– It’s like Facebook but you as a teacher can control it and use it for education. You can create groups, talk with students and connect with other educators. Quavermusic.com– My students share songs within Quaver.com using our school account. They can save work and then another student can open it up later and add more. Aviary.com– My 5th loves this. A project we do every year is going on to Aviary and creating a Roc beat then bringing it into Myna where they can add Quantum tracks to it. My students can share beats and Myna mixes they have made with each other and add on to theirs. musicpln.org– It’s Facebook for music educators. We have our profiles, we have our disscussion forums. It’s amazing. Facebook– I know, used a lot to just post pictures and random statuses to friends. It can keep you connected though and is used a lot by students and parents a like. Great way to get information out or to keep friends you went to college with to become a music educator. Keeping up the connections you made in college are big. I love being able to collaborate not only with other schools but also with other teacher. Get connected, get collaborating. Let’s build a web and unite to give our students the best music education out there. Once a closet piper, now they all know! I’m slightly crazy everyone knows it and I know being a bagpiper just confirms everyone’s suspicions. An awkward highschooler who hated conforming, when it came time to branch out to other instruments I decided bagpipes were at the top of the “must learn this” bucket list. While all the other students who took lessons would travel downtown and go play their guitars and flutes and drums I would hop in my car and drive a half hour to the nearest piping teacher for my lesson every week. Now, almost 6 years later it’s sometimes the only thing people remember me by. “Oh! your the piper!” they say and my response is always a proud “you got it!”. Piping is another reason why my students stay interested. I love to bring them in and play setting aside lesson time to not only pipe but really demonstrate what Celtic music is really all about. Why do I set aside time to do this? It gives my wonderful students a chance to see me, a chance to see a part of what I am about other than a teacher. Play a different instrument? show your students I bet they will love you for it. 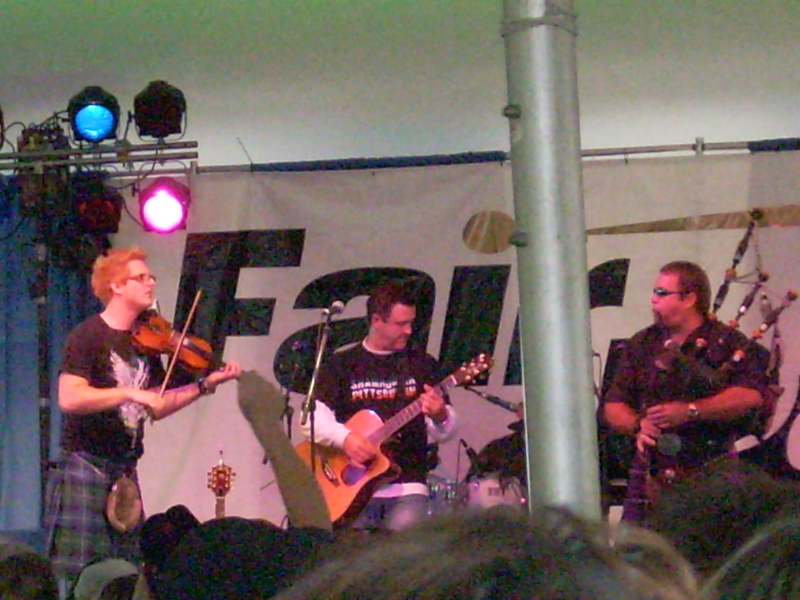 What do you need to do a lesson on Celtic music? Well I have a power point of pictures with different dress, instruments, people whatever I would like to show my students to give a little background before bringing up youtube and running down my playlist of performance clips bagrock groups like The Red Hot Chili Pipers. 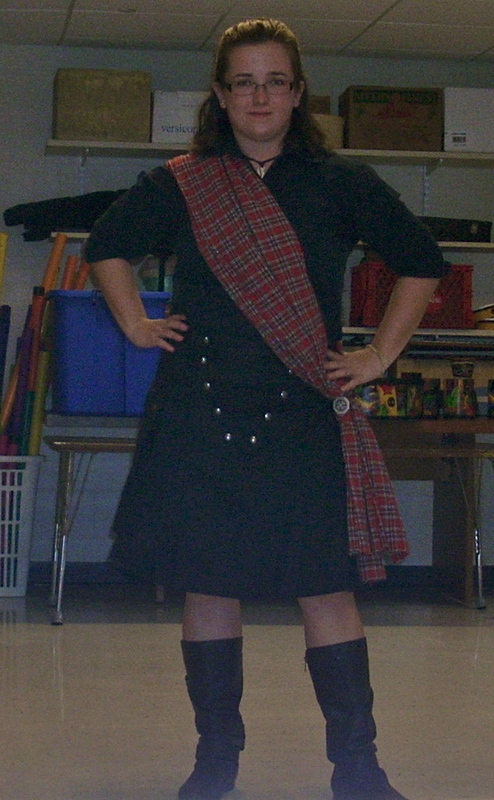 After, I get on that kilt and start playing those instruments. I have an irish whistle, bodrhan, and full size highland pipes that I demonstrate. I’ll play, depending on the instrument I’ll let them touch and then they can ask questions. Students love something they do not see eveyday, for my classes it’s piping, for you it might as simple as a drum. You ask them to play for you all year long, why not play for them for once. ●	Students will identify Irish rock through listening. ●	Students will listen to some RHCP and move to it. ●	The teacher will talk about what the Highland Games are and what goes on a the games. ●	The class will watch some performance videos and look at some pictures. ●	The teacher will discuss the outfit. ●	If time the students will be able to touch the pipes and questions can be asked. ●	Students will move to the RHCP beat. ●	Students will be able to ask questions about the material. Want to do this lesson but don’t have access to a bagpiper? There are so many of us all over. If one is not local then go global, I’m here with Skype along with hundreds of others all around New England. Keep the personal stuff off of it!- Unless it’s your personal Ipad (if that’s the case then you need to set boundaries if you let students use it!) I suggest not even google searching for personal reasons on any school Ipad. Students have the capability of stumbling across it at any moment even if they are not looking for it. Only use it for class purposes so you can breath easier about students finding anything about you that they shouldn’t know. Folders are great- Separate by class, grade, project, what ever is easiest. I am using mine for a grant project and have a folder right on the dock labeled “project” in this folder are THE ONLY items the students are allowed to use when we work on the grant. I have others labeled for each class or occasion I need them for. Keep students focused on the task at hand and if they have to sift through hundreds of apps to find the one they need it will distract them and waste time. An Ipad needs to be organized in order for it to be effective. No mail- Plain and simple, again unless it is your personal Ipad or have a specific email you need students to be using on them do not add any mail. You know if you accidentally do and hand it to a student you are going to get that one funny guy who decides to send something inappropriate from it while you are not looking and guess who gets in trouble for it? you do! Hide the important stuff- I teach K-5 and know at least a handful of students who will see a pretty looking app and want to touch it some will mess up that Ipad for good. That settings app for example is kind of cool looking one student finds that they could passcode lock your Ipad to the point of reset. Hide that app in another folder, somewhere where they wouldn’t go. I have a folder labeled “tools”. I tell students nothing. They see the folder, are not interested and just keep going. I have yet to have a problem! Minimal is better- Do not overload the Ipad with apps galore, it will overwhelm any student. Make things simple and easy to get to. Not only will they stay focused and on the task but they will also be less stressed about getting there and be independent technology users. Passcode lock- It is your friend if you’re in a busy room or area. Students are less likely to touch if they can’t get in there. I always passcode my personal Ipad and sometimes have the passcode set on the school ones to only need the passcode when turned on or off. You can also passcode certain settings in the Settings app as well!. Autofill- Turn it off, Turn it off, Turn it off. Causes headaches and unwanted questions (I sometimes yell at it too, and shows words that students might not need to see. Clearing history- I try to do it at least once a week if the Ipads are heavily used. It’s just a good thing to do and prevents any trouble. You can do it once a week and just look over the history to make sure students only are going where needed then just clear it out afterward. Set the rules- This is just an overall with the Ipads. My students know how to use them, where to use them, how to hold them, and what happens if those do not happen. I try to be active and facilitate when they are working independently with them or in small groups. They know I’m going to be checking in on them and they know what is going to happen if they are not focused on the task at hand. Just a few things I do to keep this piece of technology a successful tool in my classroom!